Still feeling a little backed up from the holiday feasting? You are not alone. The bowels like regularity, so when you change your mealtimes, skip your normal workout, going through additional stress or even change timezones you can get backed up. With the holidays in full swing all of the above can occur all in one day, so no wonder you haven’t had a bowel movement in a few days. The number one thing to make sure you are keeping on top of during this time (and really any time, but even more during this time of year) is drinking enough water. It is common for people to naturally want to drink less water in the winter time. We aren’t hot and sweaty so we don’t feel thirsty as much, however it is just as important to hydrate in the winter as during any time of the year. Another great habit to form is taking a probiotic. We at EBOOST think it is super important and is why we created our own probiotic. Our ‘Daily Gut Check’ is full of live probiotics from 10 different strains helps support digestive and immune health by restoring the natural balance of the good bacteria in the digestive tract where 70% of the cells that make up your immune system reside. In addition to these live cultures, it also contains a proprietary blend of 6 digestive enzymes to help digest macro food components (carbohydrates, proteins, and fats) and help support nutrient absorption. Additionally, it is also important to eat foods that contain fiber to keep things moving. For a lot of us, you may feel extra gas with being constipated so the last thing you want to do is add more gas. Well, getting nutrients in more of a liquid form like a soup full of fiber can be a bit easier on your stomach. Spread the squash and carrots on the baking sheet, and bake for 45 minutes. 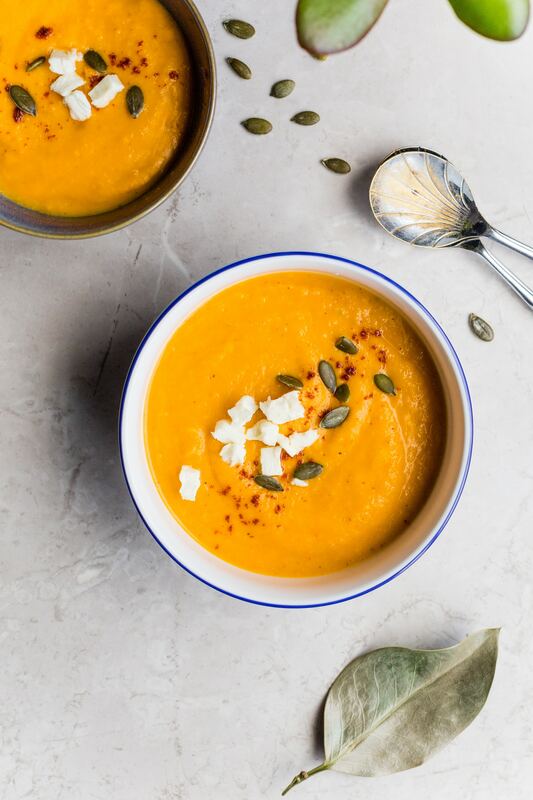 Blend the squash, carrots, coconut milk, broth, and salt in a blender or using an immersion blender until smooth. Transfer the soup to a pot, set over medium heat, and cook for 3 minutes. Add the kale, and cook for an additional 2 minutes. Serve drizzled with the olive oil and sprinkled with the pepper, parsley, and sunflower seeds.